Learn how to use Bare Conductive paint and make a neat Christmas card in this fun workshop on Saturday, 14 December, from 1pm to 4pm. 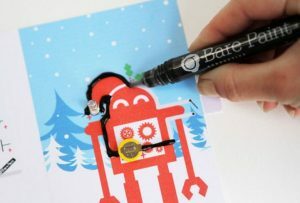 Bare Conductive paint is electrically conductive, giving you a great way to make circuits without needing to know how to solder or how to use a soldering iron. Non-toxic and fun, you’ll be able to make a light-up Christmas card in this workshop with a bright Christmas-themed card, flashing LED light, and battery included for each participant. The workshop is open to all ages, and will cost only £7. Only 15 places are open, so please book now to avoid disappointment. To book your space on the workshop, visit our Eventbrite page!